New Hope Housing at Harrisburg (NHH at Harrisburg) is a four story, 92,000 square foot, mixed-use development on Houston’s newest rail line in the up-and-coming East End neighborhood. It is an apartment community owned and operated by New Hope Housing, Inc., a non-profit organization committed to providing life-stabilizing, affordable, permanent housing with support services for people living on very low incomes. NHH at Harrisburg is funded by low income housing tax credits, government grants and charitable contributions. The new building will house NHH’s corporate offices on the fourth floor with 180 degree views of Houston’s downtown skyline just a mile away; meeting rooms for neighborhood groups, which will further connect NHH into the life of the neighborhood; 175 single room occupancy (SRO) units, NHH’s signature affordable housing type that they have developed in Houston over the last twenty years; and tenant-occupied retail space at the street level. The transit-oriented development takes advantage of being at the intersection of Sampson, one of the major north-south thoroughfares in the East End, and the Harrisburg rail line. It is designed as an urban building that occupies and enlivens its streetscape with a firm cubic form that is invigorated with a curved form that ties the residents’ first floor public spaces together with the offices on the top floor. With a bus stop on site and a rail stop one block away, the project is ideally located to serve its population. The building responds to the transit-oriented development ordinance by creating a pedestrian realm to reinforce the urban quality of the Harrisburg corridor. Retail space will front the building on Harrisburg to encourage the foot traffic on one of Houston’s newest mass-transit-served walkable corridors. The unifying concept of the housing component of the development is dignity, a notion that the NHH Board of Directors defined with its initial housing property, built in 1995. 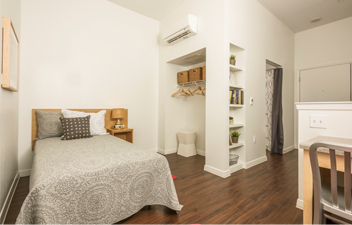 For NHH, dignity means each unit has its own bed, window, air conditioning control, private bath, and a lamp and chair for reading. A microwave and refrigerator also provide the ability to store and prepare food. Communal amenities include a large kitchen, library, TV room and central landscaped courtyard for the residents and their guests to use. The communal spaces encourage residents to come together for meals, movie nights and other social activities. 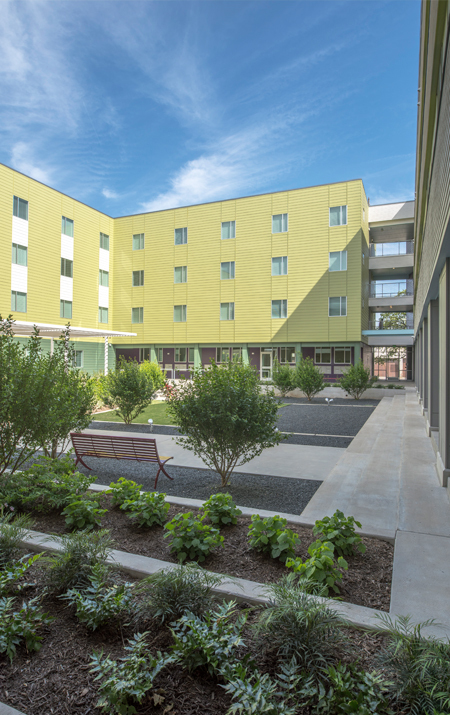 The courtyard can be glimpsed from Sampson and Harrisburg to provide pedestrians a hint of the green oasis at the center of the affordable housing community.